After Donald Trump’s surprising election win last month, scores of younger investors made big bets on ETFs that have performed extremely poorly, according to data from Bloomberg and TD Ameritrade. Two of the most popular post-Trump bets among Millennials were the triple leveraged Direxion Shares Exchange Traded Fund Trust (NYSE:JNUG) and Direxion Shares Exchange Traded Fund Trust (NYSE:NUGT). Those extremely risky funds are down 62% and 55% since election day, respectively. The two other ETFs that have attracted the top-five biggest inflows from millennials after Nov. 8, according to TD Ameritrade data, are the iShares Russell 2000 ETF and Vanguard Total Stock Market ETF. 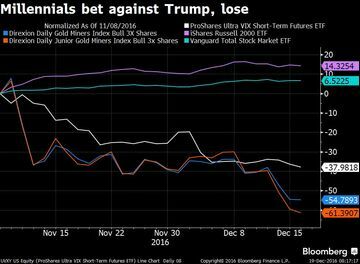 That takes the average performance of the five ETFs most favored by millennials since the election to minus 27 percent. Other bad bets made by Millennials include volatility-based funds that rise when the VIX “fear gauge” jumps. In contrast, market volatility has been extremely low since the election, with stocks trudging relentlessly higher. Our advice for young investors is very simple: always avoid triple leveraged funds, and stick to the low-cost Vanguard funds. Your portfolio will thank you.